The story of Hua Mulan, a young woman who disguised herself as a man to serve in the Chinese army, has inspired many paintings, songs, and poems in Chinese folklore. Though the details of this historical figure's life will vary depending on the source consulted, the details of Hua Mulan's heroic achievements are always the same. Legend has it that Hua Mulan's father received a conscription notice to serve in the Emperor's army. But because her father was old and ailing, Mulan took it upon herself to disguise herself as a man, don her father's armor, and take his place on the battlefield. Over the next several years, Mulan managed to keep her identity a secret as she and her fellow soldiers fought many battles defending China from its enemies. It was not until after the fighting was over that Mulan's fellow soldiers discovered her secret when they visited her home. 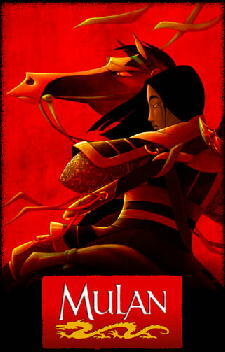 Now, the story of Hua Mulan has come to the big screen, as an animated musical by the House of the Mouse (Walt Disney Pictures). With a good mix of adventure, drama, comedy, romance, music, cutes, and less ethnocentricity than many of Disney's previous animated offerings, "Mulan" is a delightful and moving animated epic. "Mulan" is sure to delight, and it should easily overcome the obstacles of being based on a virtually-unknown legend and centering around an Asian female protagonist. She's a woman... she'll never be worth anything. The story of "Mulan" begins with the Huns, led by the merciless Shan-Yu (voiced by Miguel Ferrer of "Twin Peaks" fame), climbing over the Great Wall of China and starting a war. The Emperor (Pat Morita) issues a declaration of war and sends a decree for every family in China to send one man to join the Imperial Army. When the Emperor's counsel (James Hong) comes knocking at the Fa household to serve a conscription notice, Fa Zhou (Soon-Tek Oh) boldly accepts his duty, but it is apparent that he is no shape to be going to war. His daughter, Mulan (Ming-Na Wen, singing voice by Lea Salonga), who knows that his father is too ill to serve the Emperor, steals away in the night to take her father's place. However, Mulan's actions are also driven by another desire-- to make her own mark in the world, and not be relegated to the traditional life of an obedient wife. My ancestors sent a little lizard to help me? Disguised as a man, Mulan reports for duty at a training camp as Fa Ping, Fa Zhou's 'son'. There she meets her future comrades in arms, including the rough-around-the-edges Yao (Harvey Fierstein, no stranger to 'sidekick' roles), the happy-go-lucky Chien-Po (Jerry Tondo), as well as her hunk-a-burnin'-love commanding officer, Shang (B.D. Wong, singing voice by Donnie Osmond). Mulan's ancestors, worried about fate of their descendant, hold a meeting to discuss the situation. The First Ancestor (George Takei of "Star Trek") sends a guardian to protect Mulan in the form of a dragon named Mushu (Eddie Murphy). It is Mushu that gives Mulan her 'education' on how to be a 'man', teaching her all the wrong things about getting by in a man's world. However, the war continues to advance as Shan-Yu and his army conquers more and more of the countryside, pressing Mulan and her fellow soldiers into service. You said you trusted Ping. Why is Mulan any different? The magic of the Disney cartoon is the ability for a collection of lines and color to entertain you, inspire you, make you laugh, and make you cry-- "Mulan" is no exception. It is what I would term a 'silly grin' movie-- you can't help but sit through it with a silly grin on your face. At the same time, "Mulan" is at times very moving and touching, creating enough pathos to make even the most jaded moviegoer glassy-eyed. First-time directors Barry Cook and Tony Bancroft also create some very striking animation sequences, most notably a computer-assisted battle scene involving hundreds of Hun on horseback cutting trails through pristine mountain snow (sorry "Braveheart" fans, all the bloodshed occurs off-screen), and an grand crowd scene at the Imperial Palace. Finally, "Mulan" breaks ground narratively by having Mulan in the lead, exuding 'girl power' and making all the big decisions, bringing down the oft-used Disney paradigm of bland and passive heroines needing to be rescued by their Prince Charmings. No matter how much the wind howls, the mountain will not bow to it. However, at times, "Mulan" seems to suffer from a case of split-personality, as it jumps from serious drama to sidesplitting comedy routines. Given the subject matter, it would seem that Disney was attempting to create a more mature type of animated offering, though this is called into question with the antics of a cute cricket and a jive-talking dragon just a few short minutes away of having shown battlefield fatalities. But despite its seemingly-incongruous nature at times, "Mulan" does offer something to an audience of all ages. For the kiddies, there's plenty of cutes to go around, and for the adults accompanying the kiddies, the epic-scale drama and the romantic-comedy trappings should keep up the interest level. Definitely one for the whole family to enjoy together. You don't meet a girl like that every dynasty! All images courtesy of Walt Disney Pictures. All rights reserved.